Alana, a black angus calf, plays with Big Sky senior Caitlin Creighton at Missoula County Public Schools Agricultural Center on Tuesday morning. Alana was the result of a succesful embryo transfer. On the morning of Feb. 22, Big Sky junior Austin Standley and Creighton began taking care of Alana soon after she was born. There is still a bit of the old farm-boy and farm-girl ethic practiced at the Missoula County Public Schools’ Agricultural Center. Hard work is rewarded, gunking up your boots with manure is no sin, raising healthy livestock is the goal. From its beginnings 80 years ago, much remains the same at the 100-acre, fully functioning farm off of South Avenue past Big Sky High School. 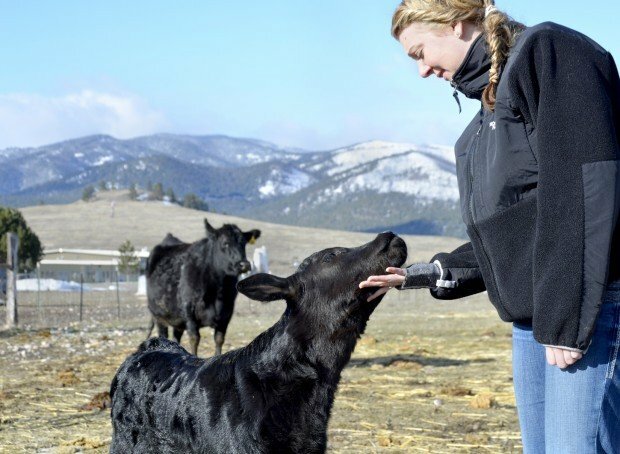 But the late-February delivery of two very special calves in the Target Range pasture speaks to the evolving emphasis of the ag-education program: The practice of livestock farming is being eclipsed by the science of it. The calves – one a heifer and one a bull – were transferred as embryos last spring from sturdy, genetically superior cows, and delivered last month by younger, healthier ones. Born on Feb. 22 and Feb. 29 respectively, Alana and the as-yet-named young bull are the first embryo transfers in the program’s history. “It’s a whole other way of thinking about agriculture,” said Big Sky senior Caitlin Creighton, who plans to pursue agricultural science and possibly law in college. The “other way of thinking” is required today in agriculture, as farmers and ranchers are faced with feeding a planet with diminishing resources, said Tom Andres, a teacher at the agriculture center. Breeding genetically superior animals saves resources and produces better, more bountiful food. Instead of supplying six to eight calves over her lifetime, a healthy cow can produce 50 or more offspring using embryonic transfer. For more than 30 years, agricultural scientists have been transplanting embryos in cattle, pigs and other animals. Alana and the male calf, born a week apart, were once embryos transferred to the uteruses of their surrogate mothers. They are the product of “super ovulation” – a mother induced to produce anywhere from five to 50 eggs – and artificial insemination from a healthy, genetically superior bull. Those inseminated eggs are extracted from the cow before they attached to her uterus, then frozen and later transplanted into the host cow. The inaugural embryo transplantation of the MCPS ag-ed program began as the senior project of Roy Handley, a 2011 Hellgate graduate and now a student at the University of Idaho in agricultural engineering. The frozen embryos – at $500 a pop – were donated by Mytty Angus Ranch in Florence and implanted last May with the aid of Sleeping Giant Genetics in Livingston. The 250 or so students in the MCPS ag program have been studying the science of embryo transfer all year. And on a cold, snowy morning, Alana was born at the farm as students were in their first-period class. A week later, the bull was born. Austin Standley, a junior at Big Sky, was one of the students who helped care for Alana. He arrived just minutes after the heifer was born. All during the cow’s gestation, Standley and his fellow students learned that the science of farming is just as important as the farming itself, if the planet is to be fed. Creighton said it’s one thing to study agriculture in a book, but quite another to be on one of only three fully functioning high-school farms in the state and actually working with animals. Reporter Jamie Kelly can be reached at 523-5254 or at jkelly@missoulian.com.